Audrey Hepburn is one person I thoroughly enjoy learning more about. She just exuded class, the everyday woman, and elegance all rolled into one. There is nothing better than learning more about a person than from their closest family and friends. In Audrey's case, both of her sons wrote amazing books about her. What makes them so good is that they read like a love letters from a son to his mother. A few years ago I blogged about her son Sean Ferrer's book called Audrey Hepburn, An Elegant Spirit. Its one of my favorite books not only because of the way it was laid out but because of the private things he shared about his mother. When I finished the book my understanding and respect for her as a person grew. I not only admire her work in cinema but I admire her work in life-her family, friendships, and humanitarian work. She's simply one heck of a lady. Audrey's youngest son, Luca Dotti recently published a book about Audrey what life was like with her at home. 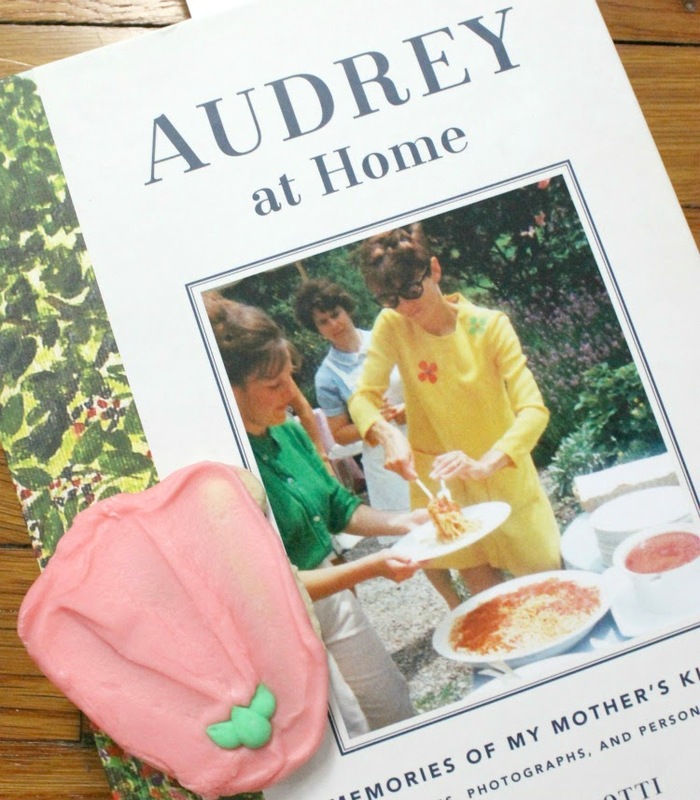 Audrey at Home: Memories of My Mother's Kitchen. I have read often that Audrey was one heck of a cook and relished her time at home with her family and friends. Much like his brother Sean's book, Luca shares a bit about Audrey's childhood and her career but what sets his apart is that he really delves into sharing what it was like have Audrey as a mother. He shares her love for gardening, pasta, cooking for her friends, and her home in Switzerland. I loved all the little bits about her he shared and all the photos but I especially loved all the recipes that he shares in the book. These recipes were Audrey's recipes and so in my opinion are little bits of treasures that he is giving to us, the reader, something you really can't find anywhere else. My second Audrey book is How to be Lovely: The Audrey Hepburn Way of Life. It is a small hard covered book that is jam packed with wisdom that is a blend of Audrey's own words and reflections on those words. I found this book to be refreshing and the way the author divides the subjects like happiness and health and how we can learn more from Audrey's own life and words. I just loved it. I can read and re-read this book and still find something new that I can reflect on within myself. What I liked best about discovering this book was realizing I am not the only one that is in awe of this incredibly inspirational person who just happens to be one heck of a famous classic Hollywood film star. I couldn't recommend these books more. The are both treasures especially is you are a big fan of Audrey's work like I am. Have you read either of these? Have you read any books on her? Just below are a heap of Audrey Hepburn related posts that I have written through the years. I hope you enjoy them! Terrific reviews! I've not read either, but both have been on my vintage related book wishlist for some time now. Thank you for the detailed peek inside - I'd love to get my mitts on either now all the more. I hope you're doing well and having a beautiful spring, sweet dear. I think of you often and am delighted that you've been blogging so many fun topics here lately. This topic has always sparked the interest in my life. Audrey was such a GRANDE lady, not only due to being a part of the Movie Industry. Oh, no. Her greatness came after that. The dedication to her family, the restless humanitarian work - those are the golden features of this Star.. that is what made her "the star" in my eyes. Thanks for the review Daffny. These books sound so amazing and I have always been in awe of Audrey, she is such an inspiration, that I have just purchased them for myself.